I can say with complete certainty that I will go to school tomorrow with bags under my eyes, a possible headache from sleep deprivation, and the new musical themes from “Pirates of the Caribbean: At World's End” still playing in my head over and over. But such is the nature of this fantastic film that I could not even try to go to bed right now if I so desired. No, it's best to get my thoughts on paper so that the bags under my eyes won't be too heavy come morning. 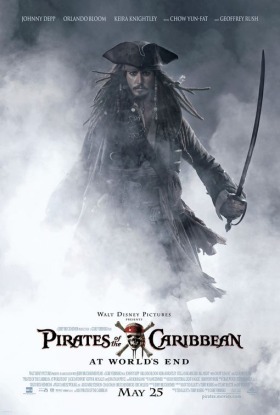 At this point, I would normally do a bit of a plot summary, telling readers details of the beginning of the film, but yesterday, Disney issued a plea to all Critics to abide by the "Critics Code" (much like the Pirates Code heavily discussed in "At World's End") which basically states that I cannot reveal major details of the plot. The dilemma is, what do I say, and what do I refrain from writing? Hopefully, Disney won't get mad at me for telling readers that the film opens with our heroes (Elizabeth, Will, and devilish anti-hero Barbossa, along with the rest of the crew) in Singapore, searching for Captain Sao-Fang, who can give them essential information on the rescue of Jack Sparrow.From the get go, the film is very plot driven, and even in the big opening action sequences, there are plot twists aplenty. Let's just say our heroes must rescue the good Captain and arrive at a meeting with all 9 Pirate lords, where the future of Pirates will be decided. See, Cutler Becket (that little "high and mighty" twerp from Dead Man's Chest) is in possession of Davy Jones’ heart, and is using Jones to destroy Piracy once and for all. Not good for the Pirates of the world, and now they all must decide when and where to make their last stand. As I said, the plot is full of twists, revelations, unbelievable action set-pieces and totally weird head-scratching moments. You can't take one bathroom brake in the film's 167 minute running time, so I would recommend buying a small drink at the Concession stand. Yes, this film is very long, but felt much shorter than Dead Man's Chest, because At World's End requires every second to tell its plot, which is fantastic, and is worth the sore bladder. Without being able to reveal much of the plot, let me just tell you that it is very complex---more so than the other two films combined---but it completely worth it if you can follow it. If you expect a simple action blockbuster, wait for the new “Die Hard.” This film is anything but simple, but in the absolute best way possible. My only big complaint with this film is that, while very entertaining and fun, it just doesn't have the same amount of potential replay value as the other two films. I will continue to watch Curse of the Black Pearl probably once a month, and despite my quips with it, Dead Man's Chest a few times a year too. But being mostly plot driven, At World's End will prove to be less re-watchable. That doesn't make the film any less excellent, but with so many twists and turns, watching this over and over would be a bit difficult. One of my favorite things about the film is, ironically, one of the things that disturbs me: “At World's End” is easily the most violent and dark film, the opening scene depicting mass gallows hangings, including the hanging of a young child. I applaud the film for not backing down from its violent content, not being afraid to show its darkness, but at the same time, I am worried about the amount of young kids that will see this. No one under the age of 9 should see any of these films, and no one under the age of 11 should see this one, and even then parental guidance is suggested. But Disney is heavily marketing this to kids. While waiting for seating to start, I walked to a Waldenbooks and found a display of Child-themed storybooks from the new film that will encourage youngsters to see the movie. They absolutely should not. I, for one, would have had mass amount of nightmares from some images in this film. So, in the end, “At World's End” provides a pitch-perfect conclusion to the franchise, and I hope they don't make a fourth, as it would spoil the enchanting ending this film offers. Of all the sequels coming out this summer, “At World's End” is the first to hit the ball out of the park, and I hope more sequels could be this good. This film will never top the original Pirates movie for me, but I knew that going in, and enjoyed this one all the same. Go ahead, give Disney your cash; it's worth it. But please, leave the young ones at home.